The discussion begins about the middle of September every year. Me: Its about time to start feeding the birds. He: Its the harvest season. Let them eat at natures table. Theres still plenty of seed out there. As the weeks go by, the stakes raise. Me: There wont be soon. Itll be cold winter and the birds will be starving. He: Feed them, and the cats wont be starving. Theyll be fat and happy. Soon, Im feeling their hunger. Darwinian, hes arguing for survival of the fittest. Me: The birds are hungry. He: What did they do all the thousands of years before you got here? Eventually, we reach the bottom line. Me: I like to see birds. He: I dont want my new deck furniture covered in bird droppings. This is a new problem. Always before, Ive simply started feeding when, sometime in November, I reached my bottom line. This year, I have to clean up the mess that falls onto the deck below from the rooftop where I broadcast feed. Thats a job. And its not the worst news. He: Just remember: Those birds could be carrying West Nile virus. But they probably wont be. I cant count my blessings in good conscience when all my feathered friends go hungry. So He and I have compromised. Instead of scattering seed all over the pitched roof outside my bedroom window, Ill get a feeder. That should cut down the mess. Im feeling like a kid in a candy store at Early Birds in West River, where Ive been lured by Suzie Robertsons ads. Im taken by wonderful, sturdy Plexiglas tubes in many sizes. Some are enclosed in grills so the birds can hold on. Fetching names and bewildering shapes abound. Theres the fat, ample Sky Cake for about $40 or the Big Top Feeder for about $50. The birds winter feeding tab will be a fat one, too, he says. Theres an underlying theme to these contraptions: protecting the feed from squirrels who, Im led to believe, pose some sort of obstacle when youre hanging bird feeders. I can see these feeders suspended like bunches of bananas from the overhanging branches of the giant old maple tree I awaken to each morning. Clearly out of the reach of the squirrel or two who reside thereabouts, no doubt. Im visualizing bird breakfast when he brings me back to reality. Plexiglas gets ugly as it gets old, he says. No matter. Theres lots more to choose from. I could even match my feeder to a particular species: finch, chickadee or cardinal. But Im used to species diversity, and thats what I want. There are some cute flat feeders, dishes of one kind or another, so the birds can hop right in. But when they do, the seed will spill right out. I might as well be broadcast feeding. I consider a nice, glass-sided fly-through cedar feeder, until I imagine it tumbling off the roof. Hes had about enough bird brow sing when we come upon one we both like, a tiny Oriental-style cedar house with glass walls. You lift the roof to fill the hopper, and seed spills out of a well into a tray. Sold, for under $20. Ive hung my striking cedar pagoda, filled with a rich mix of black sunflower seed and nut meats, safflower seed for the colorful birds and, for the doves, some millet. While Im out on the roof, I watch Mr. Squirrel watching me. Perhaps Ill give him a nut or two one day. That afternoon, Im back at Wild Birds, alone. I need some thistle seed to reactivate a finch feeder, a well-used and  yes, hes right  no-longer so attractive Plexiglas tube. And I need one of those rustic cedar logs drilled with holes for plugs of suet for woodpeckers. Of course Ill need some of the suet plugs, too. Theyre that odd red color, Suzie explains, because theyre flavored with hot peppers to keep the squirrels away. Maybe Ill get migrators from Mexico among my birds. My maple looks like a Christmas tree for the birds. From its low-sweeping branches hang my new cedar pagoda, my rough cedar log and my refilled finch feeder. Im expecting an avian ark to arrive any day now. Ive often fed a ball team of cardinals at one time plus chickadees; bluejays; sparrows; house finches; cowbirds; juncos; assorted blackbirds, including grackles, starlings and redwings; more than one titmouse and a woodpecker or two. Not many birds. But birds often take a while to return after theyve been shut off for a few months. Ive noticed that, and so has Bay Weekly columnist Bill Burton, whos a far more experienced bird feeder and watcher than I, and who, I seem to recall, has mentioned something about the persistence of squirrels. 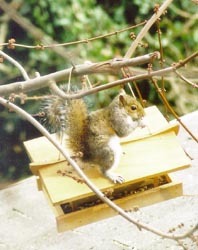 But surely our squirrels will be part of the harmonious roofscape outside our window. I can scarcely believe what Im seeing. Mr. Squirrel is hanging upside down from my cedar pagoda, stuffing himself on oil black sunflower seeds and shelled peanuts. Only his twitching, bushy tail spills out over the rim. Hulls fly out as he eats. Has he no shame? What am I to do? How? I wonder. She and her husband are smart people, both retired from the University of Maryland. Im expecting brilliance, ingenuity, rocket science. We chase him every time we see him, Juanita says. Thats fine for Juanita and Cliff, who have lots of time on their hands. Ive got a paper to put out. In short order, Mr. Squirrel has developed a less perilous method of dining. He stands on tiptoes and stretches to his full height to reach into the tray. No more squirrel acrobatics. When I fill the empty pagoda, I notice hes been chewing on the wood, too. Is he that hungry or, perish the thought, malicious? I remembered something: Returning from a couple-of-day holiday a year or so ago, I found my thistle feeder missing. It showed up down the steep hill below the tree where it had hung. The plastic was chewed up and the lid missing. I reach a disturbing conclusion: Give Mr. Squirrel plenty of what he wants or pay a price. Bright and early Saturday, Im back at Early Birds. Ive got a problem with that feeder you sold me, I say. Thats really no problem, for Early Birds is well stocked with squirrel diverters. Squirrels are why the Big Top bird-feeder has a big top. Notice the slant? asks Bonnie. Squirrels will slide right off. Squirrels, I learn, are the reason the store has so many feeders with slippery slopes and forbidding cages. If, on the other hand, the squirrel approaches from below, you can buy a pole baffle. Clearly, Im going to have to think this one out. Im about to leave when Bonnie remembers something she wants to show me. Its a T-shirt. Beneath a mug shot of a squirrel, the legend: Wanted in five neighborhoods on 17 counts of larceny. Suspect at large with a three-pound stash of birdseed in his cheeks. Estimated street value $1.37. As I unpack the Christmas decorations, I think about baffling squirrels. I am not optimistic. Ive seen whole wildlife specials on television dedicated to the clever ways of squirrels. From above or below, they defeated every human-made obstacle. They walked tightropes with an agility that mocks human acrobats. They unlocked gates with their little hands that do wonders without thumbs. They threaded mazes and remembered where theyd been. Their brains may not be big, but theyre focused. Theyve got even more time than retired people, and lots more at stake. When I cross the street to appreciate our Christmas lights, I see that my neighbor, artist Jack Brumbaugh, has hand-crafted a squirrel baffle for the Droll Yankee bird feeder hanging from his eaves. Hes crowned the hanging tube with a plastic pot. Theres not a squirrel in sight, and birds are feeding happily. Im sure that despite Mr. Squirrel, the birds have come back. I know this because the nice day has brought me onto the deck, where Ive just been sweeping seed and scrubbing  well just drop the s alliteration right here. The cedar log that I purchased for the birds is working. A big, fat red-bellied woodpecker  the kind with the white belly and red nape  caught on right away. When hes not there, a couple of hairy woodpeckers take turns visiting. Ive only seen them from a distance before. For the first time, a white-breasted nuthatch visits, creeping head downward from maple limb to cedar log feeder. Suzie was right. Mr. Squirrel doesnt much care for red-pepper flavored suet. Im getting doves and juncos, eating millet scattered on the roof by the squirrel, who spends most of his time in the feeder. But not much else. A second squirrel is attempting the feeder. Could it be Ms. Squirrel or Junior? But Im not having much of a second squirrel problem because Mr. Squirrel is on duty. And when hes consuming, no other creature can come near. When I go to a Christmas party, I like to be ready with topics of conversation. Squirrels fill the bill. Nearly everybody, I soon learn, has matched wits with a squirrel. Listen a while, and you soon figure out the inspiration behind Looney Tunes cartoons. We sharpen our wits on squirrels. When our wits arent sharp enough, some people  even suburbanites  turn to fire power. Desperate after a family of voracious squirrels made a nest in her attic, a woman I met from Silver Spring became a vigilante. Shes armed herself with a pellet gun and shoots the varmints dead. Shes ready, she says, to come to our house. Armed. Maybe Im just feeling Christmas goodwill, but it seems to me that if birds should eat, so should squirrels. They contribute as much in antics as birds in beauty. If I can figure out what squirrels like best, maybe theyll stay out of my feeder. Then I can have birds and squirrels too. 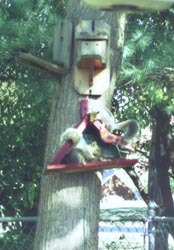 At the Burtons on Stoney Creek, one tube and one house-shaped feeder hang from a wire between two big trees, a wild cherry and a black walnut. If Burton left it that way, the squirrels could walk right in. Until he substituted a fine strand like piano wire. Now they slide off. For good measure, he added baffles. If its good enough for Bill Burton, its good enough for me. Ill figure out a strategy for peaceful coexistence. Knowing the hungry ways of squirrels and that some of her customers will, like Burton and me, choose to make purposeful sacrifice to squirrels, Suzie Robertson has stocked her shelves with squirrel delectables. Peanuts in the shell sell for $1.50 to $1.75 a pound, depending on how many pounds you buy. She also recommends pumpkin seeds, sunflower seeds, especially stripped ones; and ears of corn, which sell for 20 cents each or $7 the half bushel. Thats just the basics. For gourmet squirrels, you can buy five-pound jugs of Munch Mix  combining both sorts of sunflower seed, whole kernel corn and peanuts both raw and in the shell  for $6.50. You can buy squirrel Kobs of corn, black oil sunflower seeds and gelatin and a Squirrelola feeder to hold them. Fourteen-ounce cobs are $1.75  plus $22.50 for feeder. You can buy a nice wood and Plexiglas Chuckanut feeder with a pound of pumpkin seeds. Best of all, about $26 can buy Squirrel in a Jar. Youll bring home a glass gallon jar mounted horizontally on a frame that youll secure to a post. The jar holds both the food and the squirrel, who has to go inside to eat. Both food and squirrel keep dry. You could buy all that. I bought a Squirrel Swing. Thats a simple coiled wire basket shaped to hold a single ear of corn. Id have liked the Squirrel Windmill, so squirrel would have had to dance for his dinner. Its four sharp, pointed arms each hold an ear of corn, but when squirrel jumps on any one, the pinwheel spins. Id surely have bought it if I could have figured out a way to mount it. Im also bringing home six ears of corn plus, just in case, a pound of peanuts. Even woodpeckers fly when squirrel comes hopping down his limb. Corn? What corn? This squirrel prefers dining from the pagoda. This morning when I climb out on the roof, I sweeten the corn with peanuts. Most of the nuts fall out of the Squirrel Swing onto the deck below, but Ill worry about the results of that next spring. Few birds to be seen, though a brave little chickadee snatches sunflower seeds when Mr. Squirrel is trying some corn for breakfast. Next comes a jeering bluejay. Mr. Squirrel twitches his tail, then runs down the limb. Three birds hurry to the feeder, but when Mr. Squirrel returns, all but the cardinal fly. As Mr. Squirrel eats, chickadee and sparrow return and watch. When Mr. Squirrel jumps up on a branch for a tail-twitching break, titmouse takes a turn. Now a half dozen birds peck on roof or wait on tree. But none goes to the feeder when Mr. Squirrel eats. The tables are turned. Today at the feeder, Mr. Squirrel is dive-bombed by two small birds. He escapes to the fork of the limb and the chickadees feast  until he returns. Its a combat zone out there. From the fork of the maple trees main feeding branch, Alpha Squirrel (as hes now known) controls all access to feeders. Hell be hopping down to breakfast when he senses a competitors arrival. First, he turns to glare. If the intruder advances, Alpha charges. Meanwhile, a bluejay bombs the pair. Alpha would rather go hungry than let the intruder into his banquet hall. But as uncontested moments pass, his vigilance yields to hunger and down he hops to eat. So much for Christmas spirit. Back from two days and a night on the town, we find two empty and two missing feeders. Mr. Squirrel has vandalized both the Squirrel Swing and cedar log feeder. I find them later, down below. Every day this new millennium, Mr. Squirrel has ignored the corn (two varieties, Indian and feed) and chosen birdfood instead. Onto the feeder he hops. Theres not a bird in sight as he fills his squirrely cheeks. Seed is low. Maybe thats why Mr. Squirrel seems to be cooperating, nicely eating Indian corn. If he keeps playing by my rules, seed may hold out until I can get to Early Birds. No: Hes got to have a balanced meal and switches to birdseed. 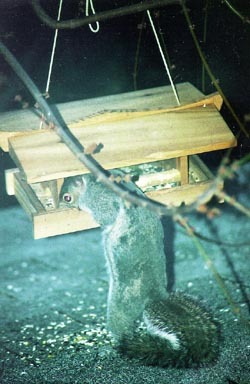 Action is heavy around the thistle feeder, which Mr. Squirrel mostly ignores. Goldfinches are feeding, two and three at a time. Theres a bright chartreuse hue to them, and I wonder if mating is looming. Tradition has the birds mating on Valentines Day. First light has just broken and seed just been scattered when Mr. Squirrel comes creeping. He stops at the fork of the limb. Looks both ways. Has a scratch. This is his domain. Hes in no hurry. When alls well, two squirrels coexist not only peacefully but cooperatively. One sits atop the limb, reaching down into my Squirrel Spring just as its instructions say he should. The other sits on the roof below, gleaning dropped kernels. Alpha Squirrel is robbing the feeder so intently that he misses the approach of Junior Squirrel, who goes for the corn. When Alpha notices, he rushes the competition, chasing him down the limb. Then the victor waits at the ready to run his rival off. Heres some action: Having had difficulty reaching kernels of corn on a half-empty cob, Mr. Squirrel has wrenched it from his Squirrel Spring. Hes about to make off with his bounty when he bumps into his bushy-tailed competitor, dropping the corn 50 feet below. On this snowy morning, the squirrels are hungry and theres nothing but trouble on the roof. As Alpha approaches a feeder, his watchfulness snaps him back like a rubber band onto the snow-thick limbs. He heads for each feeder  even the pepper-flavored suet  but each time, the instinct to chase gets the better of him. This rival is wily. Now hes sneaking upside down the underside of the limb while Alpha runs along the top. The two worry each other for the better part of an hour. When theyre nice and tired, a third squirrel appears. On this cold, snowy day, my Squirrel Spring is empty and so is my corn crib. Squirrel will have to make do with birdseed and peanuts. I throw out extra handfuls. Mr. Squirrel wasnt satisfied. In what I cant help thinking of as a fury  though I know its sloppy thinking to attribute human feelings to animals  hes gnawed off thick maple branches and scattered them on the roof. Now here are two hungry squirrels, no corn and a blanket of snow over both peanuts and my rich fruit- and nut-studded bird diet. All nature awakens to a blizzard. As the snow flies, four squirrels prowl, digging in deep rooftop snow. Once more today, my Squirrel Spring is empty. A cob is finished every couple of days. Maybe Mr. Squirrel knew what was coming. I toss out a cob onto the snow, and it keeps one or another squirrel busy for hours. Three squirrels are feeding among the birds. All are apparently too hungry to take notice of one another. Amend that. Alpha squirrel just dispatched the competition. Even under these conditions, catching sight of a rival provokes a squabble. Writing about snow this week, Bill Burton says squirrels scratching clears the way for birds to find seed. I dont know about that, but between birds and squirrels, my roof looks life a chicken yard. With all the snow, Im needing bird  and squirrel  food more often. What are my odds of limiting squirrels to corn and nuts, I wonder, as I stock up. Even with sales, Im spending $25 every couple of weeks on birdseed and squirrel food. Bill Burton hasnt seen any groundhogs today, but hes seen squirrels. Its light now about 7am. By 7:05, Ive got three and before long a dozen. I feed them regular bird seed with a lot of sunflower seed mixed in. Also corn on cob and peanuts in shell, which are getting expensive. They eat suet almost as fast as I put it out. They also love peanut butter and the grape jam I learned from my Aunt MiMi to put out for catbirds. Theyre gluttons. Theyll just keep eating and eating and eating. In the words of Bill Burton, enough said.